Happy Friday! Got some good news today that I wanted to share. A couple of days ago I submitted a few photos and some brief information about me & my style to www.fashionbombdaily.com and today they featured me as FASHION BOMBSHELL OF THE DAY! I’m so excited because this is the first time that my blog is getting some recognition on another fashion site. It has definitely helped boost up my view count today too and I noticed that I got a few new followers here, on instagram, and youtube! For the most part I have been getting really good feedback from everyone and I truly appreciate it. Whether I’m liked or not, It just feels great to have other people see my looks! And if I inspired at least 1 person today, then I’m good with that! 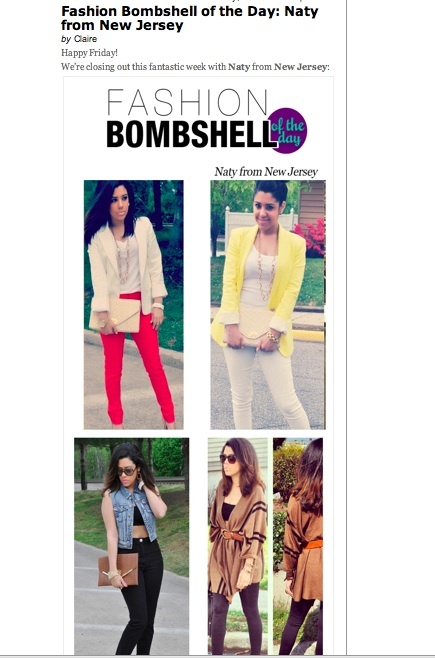 I'm one of your new readers b/c of the feature on Fashion Bomb! Love your style! I'll be following you on instagram & YT as well! Does the yellow blazer you have on run big or small? I love all of your looks by the way!!! it fits very true to size.. not too big or too small.. and thank you!! I am a new follower because of your feature on FBD and I love your style and I never met you but you seem like the most positive and sweetest person. Congratulations!! !